In 2013, San Diego Zoo Global (SDZG) expanded its horizons as a conservation leader to offer the Advanced Inquiry Program (AIP), a master's degree program that is co-delivered using a hybrid online/in-person format with Miami University's Project Dragonfly. AIP is nationally recognized and growing—the San Diego Zoo is one of eight zoo partners with Project Dragonfly, and five additional zoo and aquarium partners are set to join the national team in 2017. We are proud to announce that we have 75 students currently enrolled, and our first class of 21 students graduated in December 2015! AIP has proven to be an exciting endeavor for SDZG because it perfectly aligns with our institutional goals. It unites people from around the San Diego area who share an interest in conservation and a drive to become active members of local and global conservation communities. Students develop networks with staff and other locally based classmates, and connect with the national web-based Project Dragonfly community. From the moment they begin the program, students engage in hands-on, inquiry-based activities that empower them to ask the right questions and seek answers, strengthen their understanding of current and future conservation issues, and enact plans to lead the fight against extinction by promoting positive social and ecological change within their broader communities. With their help, we are successfully extending and deepening our reach to ignite a passion for nature in others. The following stories of our recent 2015 alumni exemplify these qualities and demonstrate the AIP flexibility that allows students to tailor the graduate program to fit their background, strengths, and personal goals. 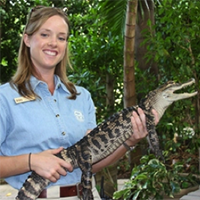 Stephanie Alexander has worked in the San Diego Zoo's Education Department for over nine years. Her master plan is to "create environmental stewards through education." She uses education to help people identify personal behaviors that negatively impact the environment and to promote change. During AIP, she evaluated the effectiveness of the Zoo's education programs, incorporated guest inquiry into animal presentations to promote audience engagement, and continually strives to identify specific actions people can take to help the environment and wildlife. Like many AIP participants, she uses what she learned during her Master of Arts degree while on the job and to inform her personal choices. 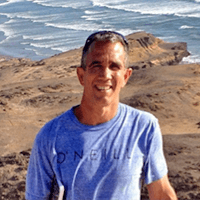 Jeff Kepper is a science teacher at Helix High School in La Mesa, a suburb of San Diego, who is passionate about marine biology. He set forth to "strengthen students' conservation attitudes through marine science activities" as his graduate program master plan. Guided by the four AIP tenets (inquiry, local and regional understanding, community participation and voice, and ecological stewardship), he has developed course curricula that give his students the opportunity to play active roles in marine conservation initiatives. They collect scientific data on field trips to coastal habitats in Southern California, and they take part in long-term conservation monitoring projects with professionals. Jeff uses his Master of Arts degree and master plan to continue to inspire his students to become stakeholders in local conservation issues. Members of our inaugural cohort are now entering the community as San Diego Zoo AIP alumni, and while their accomplishments in the program are highly commendable, AIP is designed to equip students with the tools to successfully lead long-term community action. So their work has only just begun, and the future looks very bright! We are also looking to the future in anticipation of the next incoming cohort of students, who are ready to pursue this one-of-a-kind graduate degree as an opportunity for professional development, personal growth, community involvement, and environmental stewardship. Applications are open until February 28, 2016; visit us at www.sandiegozooglobal.org/aip to learn more! 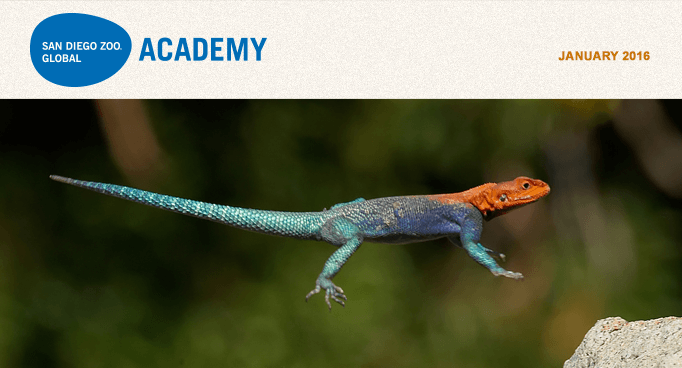 Although AIP is not an Academy program, the San Diego Zoo Global Academy strives to share relevant and interesting articles, programs, and topics about professional development and advanced learning with our readers. Our SDZG colleague Mackenzie Bergstrom can be reached at mbergstrom@sandiegozoo.org for more information about the Advanced Inquiry Program. The San Diego Zoo Global Academy Puts The Jackson Zoo In The Spotlight! The Jackson Zoo in Jackson, Mississippi is part of the Academy's collaborative learning environment. Welcome! 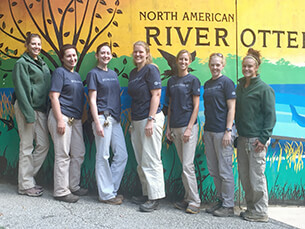 Thank you to the Brandywine Zoo for the photos of staff wearing San Diego Zoo Global Academy T-shirts. Go Team! Please join us for the Administrator's Users Group Webinar hosted by Academy partner CypherWorx. The next webinar is Wednesday, January 20, 2016 at 11 a.m. PDT. To Register for the Webinar: click here. After registering, you will receive a confirmation email containing information about joining the webinar. There are endless ways in which you and your organization can continuously enhance animal welfare. Right now. Today. Here are some simple and even enjoyable things you and your organization can do to get even better. Advanced zoological organizations employ all sorts of forms, policies, and protocols with respect to important animal care, welfare, and safety matters. These are also subject to review by regulatory agencies like the U.S. Department of Agriculture Animal and Plant Health Inspection Service and are of particular interest in evaluating compliance and reviewing serious incidents. Given the significance of these documents, they should be reviewed, evaluated, and updated regularly—perhaps annually, but at least once every three years and possibly after serious incidents. Reviews should confirm that these documents are being used and implemented properly, and, if not, revisions and remedial training might be warranted. Organizational review of forms, policies, and protocols is often conducted top down or by a selected group or individual. Reviews are a wonderful way to engage staff and draw upon their creativity and experiences. That is, learning from them on how forms, policies, and protocols relating to their daily responsibilities work in practice, and how they can be improved to the further benefit of the animals in their care. Larger zoological organizations, or ones with units responsible for different animals or species, could challenge each unit and other groups like veterinary, life support, and buildings and grounds teams to generate ideas for potential refinements. This helps everyone become more invested in ongoing improvement, which is ultimately good for the animals. Extrinsic sources helpful in prompting and coordinating such reviews are: changes in regulations or agency guidance; revisions to professional standards and guidelines; new or updated husbandry manuals; and developments reported at conferences and in the professional and scientific literature. Forms, policies, and protocols are an integral part of your recordkeeping. The Animal Welfare Act requires a good number of specific written records overall and with respect to certain species (e.g., environmental enrichment plan for non-human primates, veterinary justification for housing social marine mammal separately, written protocols, and other items). Of increasing importance are records that are not explicitly required under the AWA, but are essential for inspectors to determine compliance with broad outcome-oriented, performance-based regulations. For example, if an animal is injured by another animal, apparently because of incompatibility, the inspector will inquire about behavioral observations and related records showing careful monitoring and appropriate actions regarding compatibility. An absence of records or gaps in recordkeeping may prompt the inspector to cite a noncompliance regarding animal compatibility, because there was an unfortunate incident but there were little if any records to demonstrate an appropriate level of care and oversight. Checking or spot-checking animal records and recordkeeping practices can be done anytime at no cost other than the staff time involved. Proactive, substantive review of select records may provide a broader and more complete picture concerning an animal or species, and could very well suggest new ideas for further enhancing animal welfare. Enrichment is an important contributor to animal welfare. A few zoological organizations have true Animal Welfare Officers, and some have Enrichment Coordinators. Many organizations have thoughtful processes for the review, introduction, and evaluation of enrichment ideas and practices. Periodically taking stock of enrichment history records for individual animals and entire species can yield patterns and insights not readily evident when evaluating ideas or efforts on a case-by-case basis. Staff working with different animals or species could share their conclusions with others in internal roundtables, and brainstorm for breakthrough ideas (based on experience and familiarity with ongoing advances within the zoological community). Professional development activities—via accrediting associations and professional organizations—are invaluable, for the individual and the organization, internally as well as externally. One of the best ways to demonstrate a commitment to continuous improvement in animal welfare and AWA compliance is to have a complete record of everyone's professional development activities, and a professional development calendar showing an abundance of internal and external learning and training opportunities. When fiscal challenges limit conference and travel opportunities, consider expanded use of online distance learning (including, of course, San Diego Zoo Global Academy's extensive catalog). When staff participates in outside activities, they should "teach" and share newly gained awareness with colleagues as another means of accelerating advances. It could even start off with a sharing session on "Here's what I learned last year that is worth sharing." These ideas can be acted upon immediately and will consciously drive ongoing enhancements in animal welfare. We only need to examine these documents, records, practices, and experiences with the clear intent of utilizing them to grow professionally and organizationally—for our own betterment and the well-being of the animals we love. We have previously talked about the model developed by Snieszko, that disease results from the interplay of three factors: Host, Environment, and Pathogen. We have also examined how a substandard environment places fish under stress, leading to an increase in cortisol, which in turns causes immunosuppression, leading to an increase in disease and even death (see diagram). Noise and Vibration — aquariums can be a noisy environment at the best of times with pumps and other equipment. Building maintenance or repairs can exacerbate the situation. Hammer drilling or jack hammering, in particular, are big concerns. Carbon Dioxide — poor ventilation above an aquarium can lead to an increase in CO2 levels, which will drop the pH of the water (due to the formation of carbonic acid). A lower pH is a stressor. At high levels, CO2 will also cause narcosis and even death. Stress of other fish — this can be either the same species (conspecific) or other species (heterospecific). There can be aggression between fish or even the fear of predation. Stocking level — many studies have shown that too high a stocking level causes stress. With some fish, a stocking level that is too low can similarly cause stress due to "bullying" issues. Keeping two or three of a particular fish species in a group can be a problem, with the non-dominant fish being harassed and chased, even to death. However, if you keep 20 of the same species in the same display, the aggression is dispersed and there are no problems. Photoperiod and Light levels — an ideal photoperiod is 12 hours light and 12 hours dark. Light timers that fail are common, causing 24 hours of light. I always recommend once a month a walk through a zoo or aquarium after hours to ensure that the lights have gone off. Similarly too bright a light level can be stressful on fish, depending on their natural habitat. Nutrition — poor-quality nutrition will always be a stressor. Buying cheap food is likely to be an expensive option in the long term as fish health suffers. Failure to add vitamin and mineral supplements can be another cause of problems. Capture and Handling — capture and the handling of fish are major stressors, with studies showing that cortisol levels can rise in less than 30 minutes. Always be as gentle as possible and use appropriate catching equipment for the species you are dealing with. Transport — on top of capture and handling, transport is invariably stressful. Maintaining good water quality and high dissolved oxygen (DO) levels is essential. Toxins (e.g. insecticides, herbicides) — in an outdoor facility, such sprays could run off after any rainfall into ponds and affect any aquatic inhabitants. While very unlikely in indoor aquariums, I have seen an issue with dying cockroaches (from a pesticide) falling into tanks and being eaten by the fish. As you can see, there are many environmental issues to consider besides water quality. Sometimes there may even be two or three factors involved, so always keep an open mind and explore every possible cause if you are experiencing problems with your fish. The Aquarium Vet team wishes Academy members all the best for 2016. The San Diego Zoo Global Academy is excited to share an additional Academy subscriber benefit regarding our collaboration with Dr. Jones: as an Academy subscriber, you are now entitled to a discount on the e-quarist™ courses. Module Six is now available — Nutrition and Reproduction. Did you know that if you have created a DIY in the past, you now have the option to edit your course without having to reload the Power Point again? Just click on DIY Course Listing, and then find your course that needs editing or updating, and click on the Edit Completed Course. It's as easy as that! Automatically register all new volunteers in eLearning as part of your onboarding process. Also, post any standard operating procedures, instructions, handbooks, etc. on eLearning Resources. That way you can refer new volunteers to all online training materials as soon as they are accepted into your program. You can then monitor to ensure they are, in fact, availing themselves of all required and recommended online training materials. Emergency and Crisis Management will first indicate the actions to take during potential crises to ensure safety of employees and customers. This course will teach you to evaluate the scope and impact of a disaster or emergency and begin the recovery process. Emergency and Crisis Management is the creation of plans through which communities reduce vulnerability to hazards and cope with disasters. Disaster management does not avert or eliminate the threats; instead it focuses on creating plans to decrease the impact of disasters. Failure to create a plan could lead to damage to assets, human mortality, and lost revenue. Currently in the United States, 60% of businesses do not have emergency management plans.